With Easter soon approaching, we are celebrating the anniversary of the 1916 Rising. As well as the Easter Rising, Kevin Kenna’s All The Risings: Ireland 1014-1916 covers the eight other principal occasions in Ireland’s history on which resistance was made to the dominance of those who controlled the country’s destiny: The Battle of Clontarf, The Nine Years’ War, The 1641 Rising, The Battle of Boyne, The 1798 Rising, The 1803 Rising, The Young Ireland Rising and The Fenian Rising. All The Risings goes in depth into all of the aforementioned risings, leaving no major stones unturned. An overview of the main events, main players and impacts are included in the book, which gives an accessible, overarching view on how rebellion has shaped Ireland’s history. The section on the Easter Rising includes a summary of the main events and the main factions involved, alongside historical photographs, documents and portraits. 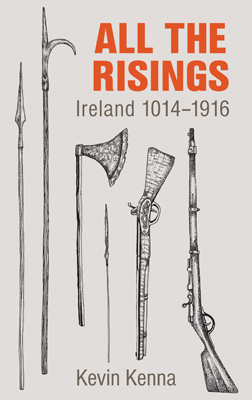 If you would like to read more, All The Risings: Ireland 1014-1916 is available to buy here.